A one off book describing some of the pests of the vegetable garden, together with embossings of the leaves of the plants the insects attack. Some pages have been distressed to imitate the damage to the plants. 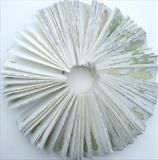 Although this work has been sold, I am happy to be commissioned to make another, similar book. This is an interesting inventory of some of the hazards had befall the vegetable and fruit gardener. For every insect there is a description of the damage it can inflict and an embossed leaf from the particular plant that can be attacked. Pages are holed, nibbled, stained and cut to show how, for instance, the snail, leaf miner or beetle can make the gardener's life a misery at times! 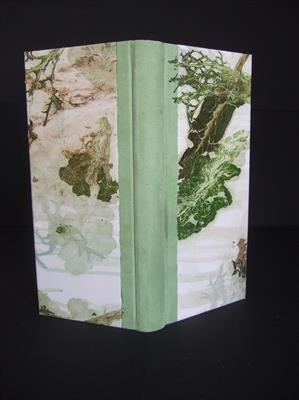 The book is hand made and bound, with a pale green suede spine. A delight to handle.